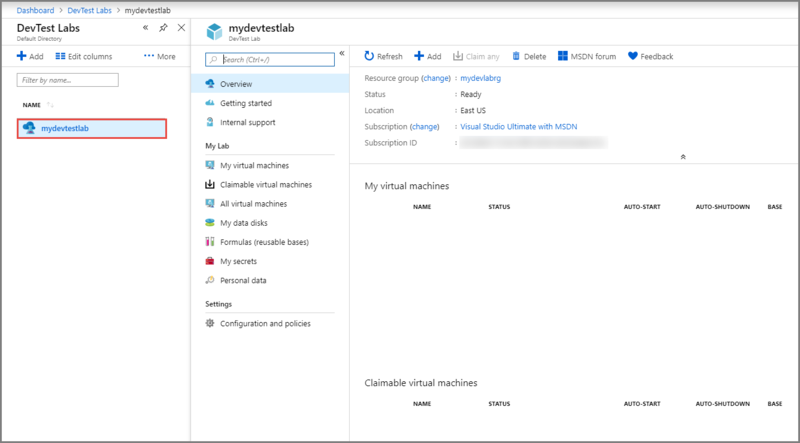 A lab in Azure DevTest Labs is the infrastructure that encompasses a group of resources, such as Virtual Machines (VMs), that lets you better manage those resources by specifying limits and quotas. This article walks you through the process of creating a lab using the Azure portal. An Azure subscription. To learn about Azure purchase options, see How to buy Azure or Free one-month trial. You must be the owner of the subscription to create the lab. From the main menu on the left side, select All Services (at the top of the list). Select * (star) next to DevTest Labs in the DEVOPS section. This action adds DevTest Labs to the left navigational menu so that you can access it easily the next time. Now, select DevTest Labs on the left navigational menu. Select Add on the toolbar. Enter a name for the lab. Select the Subscription to associate with the lab. Enter a name for the resource group for the lab. Select a location in which to store the lab. Select Auto-shutdown to specify if you want to enable - and define the parameters for - the automatic shutting down of all the lab's VMs. The auto-shutdown feature is mainly a cost-saving feature whereby you can specify when you want the VM to automatically be shut down. 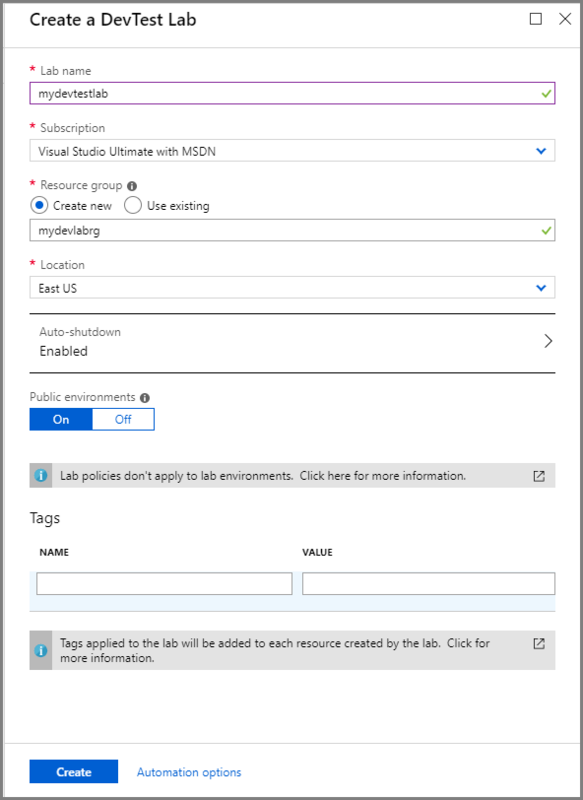 You can change auto-shutdown settings after creating the lab by following the steps outlined in the article Manage all policies for a lab in Azure DevTest Labs. Enter NAME and VALUE information for Tags if you want to create custom tagging that is added to every resource you will create in the lab. Tags are useful to help you manage and organize lab resources by category. For more information about tags, including how to add tags after creating the lab, see Add tags to a lab. Select Automation options to get Azure Resource Manager templates for configuration automation. Select Create. You can monitor the status of the lab creation process by watching the Notifications area. Once completed, select Go to resource in the notification. Alternatively, refresh the DevTest Labs page to see the newly created lab in the list of labs. Select the lab in the list. You see the home page for your lab.